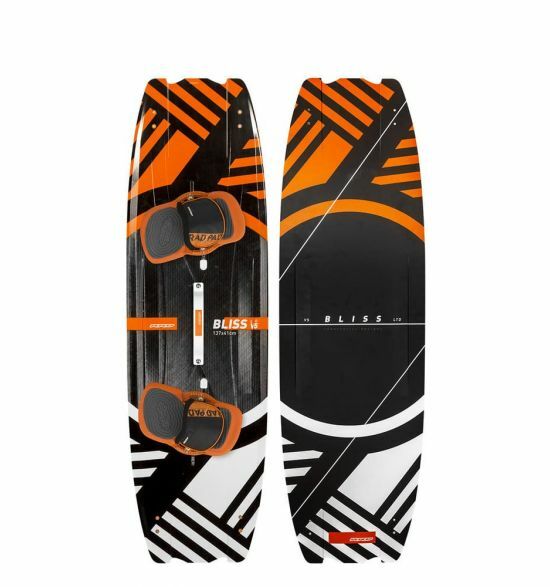 The Bliss LTD V5 allows riders to enjoy the smooth rides that this board offers while maximizing it freestyle potential. The shape and track channels are the same as the wood version, but the LTD construction consists of Biaxial Carbon layers on the top and bottom of the board with a special mix of Paulownia and lighter weight wood, CNC shaped core. It 20% lighter, thinner, more responsive, and, of course, provides loads of pop. Because of the carbon, the board is slightly less forgiving than the wood in choppy waters, due to its response, but still forgiving enough for all level riders to enjoy. Some of our high-end boards come out in a LTD construction which consists of Biaxial Carbon layers on the top and bottom of the board with a special mix of Paulownia and lighter weight wood, CNC shaped core. It 20% lighter, thinner, more responsive, and, of course, provides loads of pop due to a higher memory of the Biaxial Carbon fibers. Which makes the board full of energy. These premium products provide you the most dynamic ride.